For this child I prayed, and the Lord answered my prayer. When Jill reached out to me to help with announcing her pregnancy creatively I was thrilled to be a part of this exciting moment! “We want to include our dog,” she commented. “And maybe do one of those movie posters that I’ve seen on Pinterest.” And so began our collaboration. We chose an evening the following week. Ironically our session was the same day she would find out their baby’s gender! We wanted the photos to both announce her pregnancy and be a gender reveal! 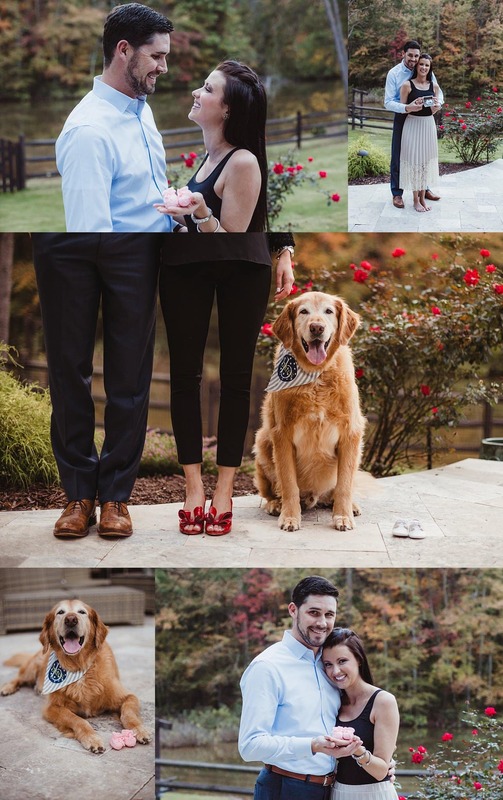 We knew that their first baby, Bates, a golden retriever, would be featured in some of the images. After all, his world was going to be changing a lot in a few months too! The weather was beautiful the evening of our session: still on the warmer side and sunny. Bates was friendly and very happy to meet a new person (me!). We started the photo session in their gorgeous lake front back yard. Jill wanted to include several ultrasound photos in a few pictures. She is very crafty and made a custom picture frame with a countdown to her due date! After we finished up outside, we moved inside for a few more shots. Jill covered her coffee table with all the foods she craved for a fun photo. We turned that image into their movie poster photograph. What you don’t see in the final image is that Bates was sitting as close as he could get without being in the picture! He was hoping a crumb or two would make its way to him! Bates was super cooperative for all his pictures. He even let Jill put some glasses on his nose while he “read” the What to Expect book! We hid his favorite toy inside the book to get him to look down. Our last images were a surprise for her grandfather. We placed those little pink booties and ultrasound photo on her Bible opened to Psalm 139. I will praise you; for I am fearfully and wonderfully made: marvelous are your works; and that my soul knows right well. Psalm 139:14. I can’t wait to follow Jill, Clint, Bates and Tinsley’s journey! Stay tuned for more in the upcoming months. 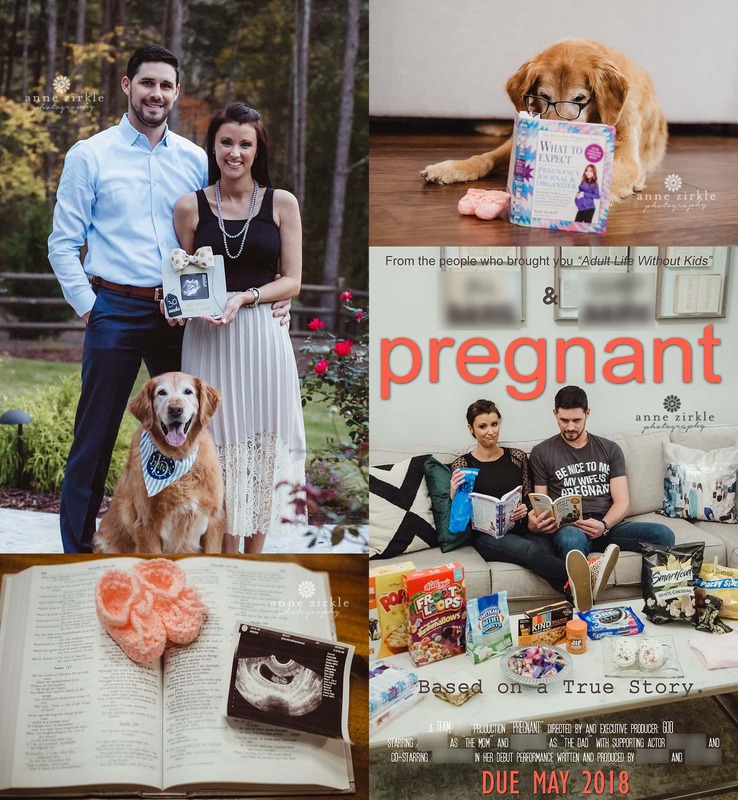 Would you like to announce your pregnancy through photos? Contact me here and let’s plan your custom session!